The silicone gloves tough enough to handle all the hot stuff. Five finger, non-slip silicone grip is melt proof. Raised grippers safely repel heat away from your hands. Versatile precision grip can pick up a pin or open a jar. 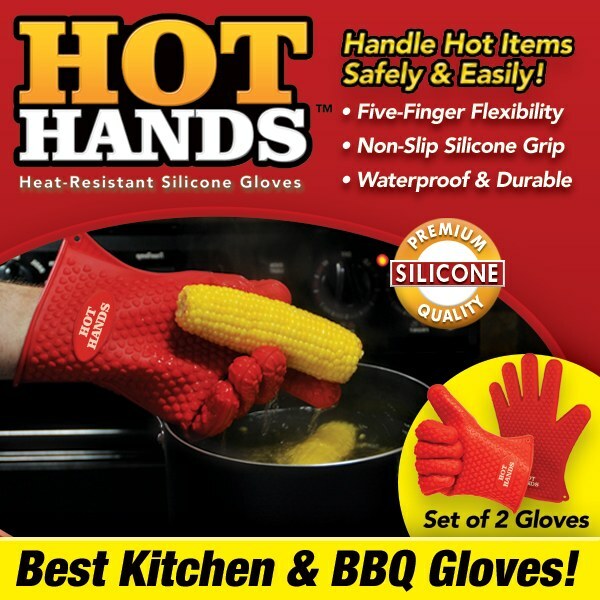 HOT HANDS are the amazing, heat-safe cooking gloves that let you easily handle any high-temperature object! Flexible, five-finger silicone gloves resist temperatures up to 425 degrees! Hot Hands are perfect for working around ovens, stovetops and grills. Easily grip pots, pans, skillets and baking trays or reach into hot water. Use them to open jars and lids, too! Non-slip grips; waterproof. One size fits all. Amazing! You must give these a try; you&apos;ll be glad you did!! Work great on the grill! Takes a little getting used to on pulling pork apart but adapt quickly! Only complaint - hands sweat and hard to remove! A little stiff but works great. No heat comes through. These things really work! My wife and daughters really love them! I like them so good I bought a pair for my son. I like how I can just grab something out of the oven or on the grill and don&apos;t have to worry about getting burnt. Loved them at cold November football games! We grill a lot so these have come in very handy. Little stiff to grab small stuff with! Haven&apos;t used for the BBQ yet, but have an old silicone mitt(no finger separation) and I love the flexibility of the "glove". I did use them to place a santa hat on our young Saguaro and didn&apos;t get stuck. They really work!! As a jar lid grip or at a Cajun boil, they are perfect. These work as promised although they need to come on sizes. They are way too big for my hands. No more burns from the stove oven and toaster oven! GOOD PRODUCT. DOES WHST IT SAYS, BUT SHOULD HAVE SOME KINDA LINER!!! Nice. You can pick up small items with ease.